Encouraging early learning is easy with fun literacy activities! 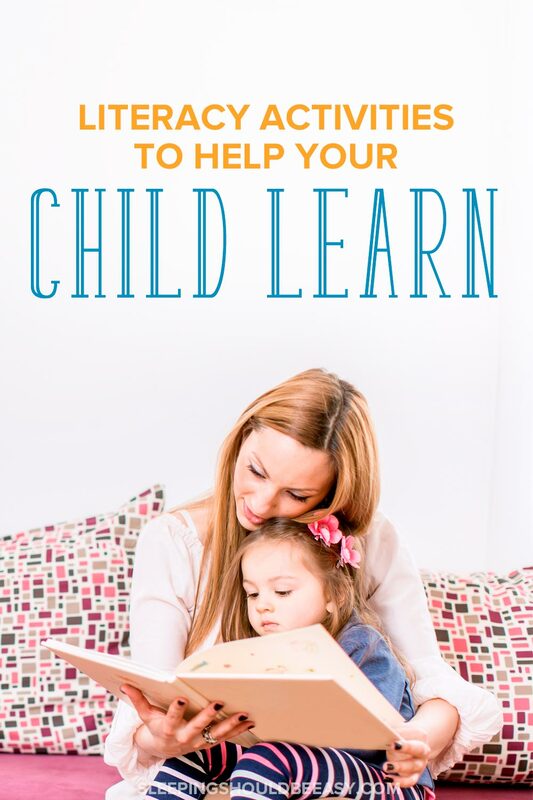 Learn why simple activities like talking, reading and singing will help your child learn. This is a sponsored conversation written by me on behalf of First 5 California. The opinions and text are all mine. From Day One, I wanted to engage my kids toward healthy brain development. I knew I couldn’t control everything, but I was determined to do what I can to raise lifelong learners. So I read child development books and scoured the internet for baby activities. I even read aloud to my pregnant belly. Turns out that helping kids learn is much simpler. You can even sum it up in three activities anyone can do with children: talk, read and sing. Talking, reading and singing throughout the day, every day, already supports higher learning skills. For instance, just by talking to your child, you’re modeling the speech and language she can mimic and engaging her in conversation. But as simple as these three tasks may be, they’re also easy to forget to do. Our days get busy with tasks or work. The kids seem too young to talk to, or we don’t know what to talk about. We may feel self-conscious to sing, even to our kids, or we may not have the resources to help them learn. That’s why I’m excited that First 5 California and Scholastic have partnered, for the fourth year in a row, to bring you the Talk. Read. Sing.® website. This FREE online resource is full of lesson plans and activities for healthy brain development in children. For instance, you can get free downloads of cut-out prompts that will give you ideas of just how to talk, read and sing to your child. 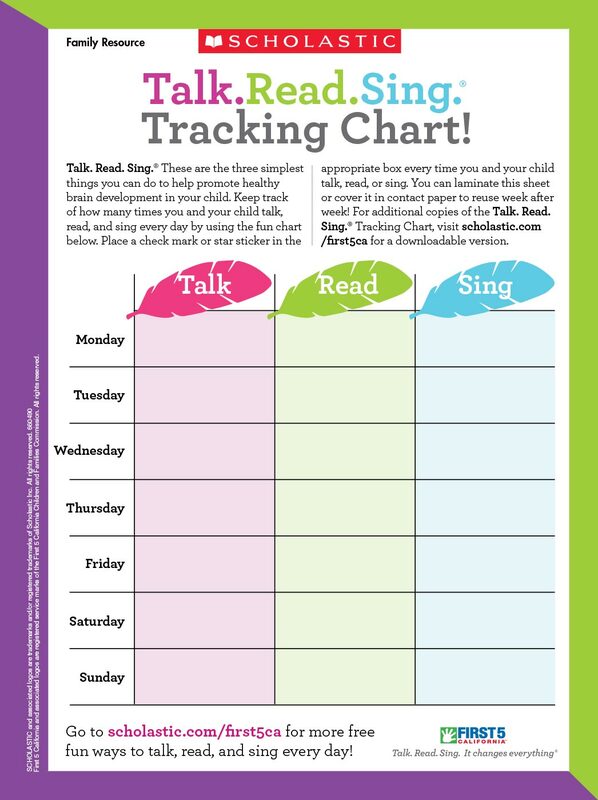 You can also get a free tracking chart to make sure you complete all three activities every day. And you’ll have access to tons of worksheets and fun printouts. You’ll get literacy lessons, activity sheets, and even free streaming music! It’s like creating your own curriculum, with all the resources available for you. The best part? Talk. Read. Sing.® will soon have a NEW APP you can download on your phone, free. The app will make it even easier to engage with your child. We already carry our phones everywhere—the app makes it just that more convenient to talk, read and sing with your child every day. As you can tell, I’m a big supporter of early childhood education, especially free resources like Talk. Read. 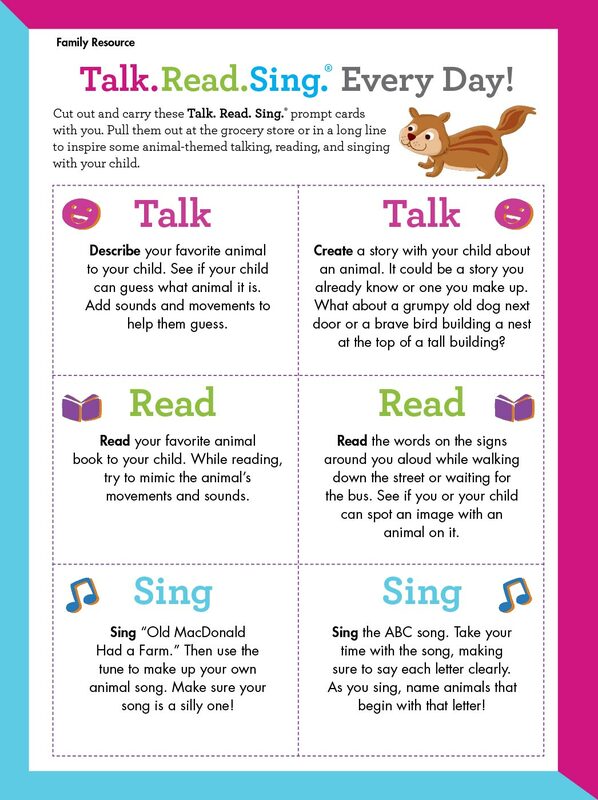 Sing.® It’s resources like these that make it so simple and easy to help our kids learn, right from Day One. Visit the Talk. Read. Sing.® website to check out your freebies! Then be on the lookout for the Talk. Read. Sing. app to help make these activities a daily habit. Tell me in the comments: What are your favorite activities to do with your child?